A friend from work meets me for breakfast every other week. We worked the same shift for several months (she's a nurse), then a permanent nurse moved in, so we decided to meet periodically rather than never ever see each other again! *sob* That would be tragic. Actually, I really enjoy Nurse Kim's company, so I was glad to find that our schedules would coincide for breakfast. What Nurse Kim didn't know yesterday was that we would have someone joining us for our morning meal. Yes! You guessed it! Here I thought everyone liked grits. 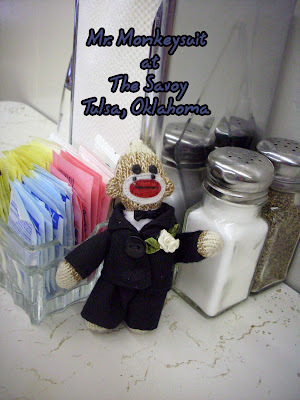 The best part of the morning was meeting the waitress - Mr. Monkeysuit certainly has an eye for the ladies, as was evidenced at the wedding this weekend. Hi pretty waitress! And then we were done! Happy tummies all around. Life caught up on. New things learned about the sock monkey. Does it get any better than that? I think not. You know, I don't think I've ever in my life even tasted grits to know if I like them or don't. I'm with Mr. M though on the bacon - YUM! Hmmm... My grandma made me try a lot of things; ham hocks and lima beans, pickled beets, sea foam jelly, zucchini, bacon cornbread... the list goes on. But for some reason, she never made me try grits. Maybe she didn't like them either? Totally stupid question, but what are grits? Love your blog......I guess I'll have to read further in to find out about Mr. MonkeySuit! Decaf? Oh, Mr. Monkeysuit. I'm so sorry. Monkeysuit doesn't like grits?! He doesn't know what he's missing. Lovely wedding photos, BTW. I can definitely see the family resemblance between you and your sisters.